When artist Matthew Willey found a bee on the floor of his paint studio in New York City 10 years ago, he got down on his knees and really saw a honey bee for the first time in his life. Willey looked at the creature as an artist, not just as a regular observer, and noticed the hairs on the eyeballs, the hairs on the legs, and all-around “cuteness” that he hadn’t seen before when bees were flying around in his yard. While he didn’t know it at the time, the bee was sick and died a mere two hours after landing in Willey’s studio. He put the bee in the backyard and came back inside to start researching honey bees. That’s when Willey discovered a phenomenon called Colony Collapse Disorder. “I was fascinated that this giant, globally devastating thing was happening, and I had heard nothing about it, not a headline in the newspaper,” Willey said. Colony Collapse Disorder occurs when hives are abandoned by worker bees without a definitive cause. Scientists have pointed to excessive pesticide-use, like Roundup, and the presence of varroa mites – parasitic creatures that latch onto bees – as probable instigators of colony collapse. More than 30 percent of hives in the U.S. collapsed in 2013 due to this phenomenon, according to the Environmental Protection Agency. Altruistic self-removal – where bees remove themselves from a hive if they are sick – is also becoming a more common practice among honey bees who do so for the good of the hive. The bee instinctively realizes that their immune system is collective – it’s based on the hive and not the individual bee. Beekeepers lost more bees in the summer than the winter months for the first time in 2015, even though hive collapse is more common in the winter. Sustainability experts say if colony collapse continues at the same rate, honey bees managed for agricultural purposes will die out by 2035. The sharp decline in honey bees will also impact agricultural costs, which are estimated to rise $5.7 billion each year, according to a 2011 Natural Resources Defense Council report. For major cash crops in California – like almonds that generate nearly $3 billion each year – the decline in bees could have devastating results as almonds use about half of the honey bees in the United States alone. 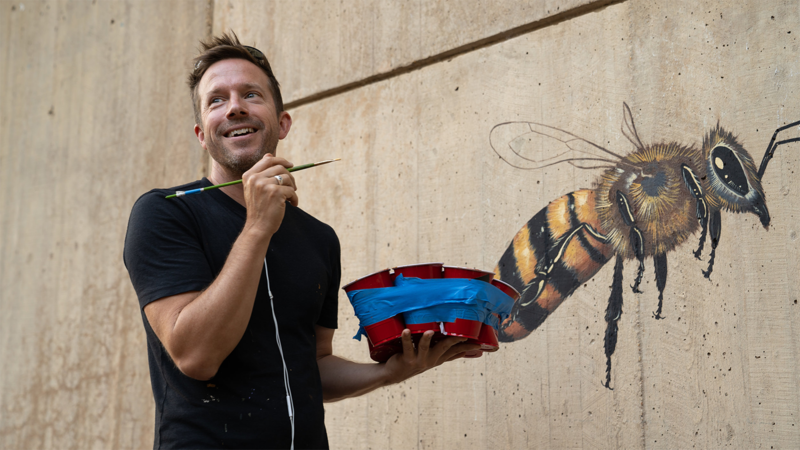 Now, Willey leads the project “The Good of the Hive.” Through the initiative – which he started more than three years ago – Willey will paint 50,000 bees in murals around the world, the same amount of bees found in a healthy hive. Willey’s current focus is the Smithsonian National Zoo, where he will paint hundreds of bees on the walls surrounding the Great Ape House. “By painting them really big on a wall and giving it emotional energy, to the bees as a collective, for the individual bees where they are, I think it changes the perception of the person when they’re in their yard with them,” he said. The mural in D.C. follows the opening of the zoo’s “Me and Bee” playground in September – an interactive area of the zoo that aims to teach children about the important role of pollinators. Willey said the project could take more than 25 years, giving the initiative's message time to spread from person to person.